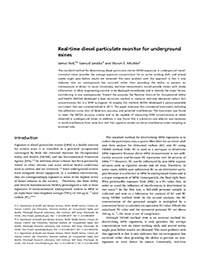 The standard method for determining diesel particulate matter (DPM) exposures in underground metal/nonmetal mines provides the average exposure concentration for an entire working shift, and several weeks might pass before results are obtained. The main problem with this approach is that it only indicates that an overexposure has occurred rather than providing the ability to prevent an overexposure or detect its cause. Conversely, real-time measurement would provide miners with timely information to allow engineering controls to be deployed immediately and to identify the major factors contributing to any overexposures. Toward this purpose, the National Institute for Occupational Safety and Health (NIOSH) developed a laser extinction method to measure real-time elemental carbon (EC) concentrations (EC is a DPM surrogate). To employ this method, NIOSH developed a person-wearable instrument that was commercialized in 2011. This paper evaluates this commercial instrument, including the calibration curve, limit of detection, accuracy, and potential interferences. The instrument was found to meet the NIOSH accuracy criteria and to be capable of measuring DPM concentrations at levels observed in underground mines. In addition, it was found that a submicron size selector was necessary to avoid interference from mine dust and that cigarette smoke can be an interference when sampling in enclosed cabs.